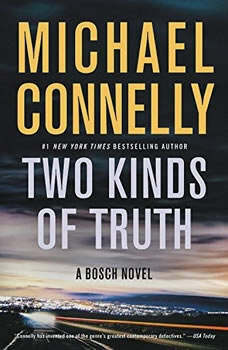 Harry Bosch searches for the truth in the new thriller from #1 NYT bestselling author Michael ConnellyAn NPR Best Book of 2017A Times Critics' Top Book of 2017 A Barnes & Noble Best Book of 2017A South Florida Sun-Sentinel Best Mystery of 2017An Amazon Book of the MonthHarry Bosch, exiled from the LAPD, is working cold cases for the San Fernando Police Department when all hands are called out to a local drugstore, where two pharmacists have been murdered in a robbery. Bosch and the tiny town's three-person detective squad sift through the clues, which lead into the dangerous, big-business world of prescription drug abuse. To get to the people at the top, Bosch must risk everything and go undercover in the shadowy world of organized pill mills. Meanwhile, an old case from Bosch's days with the LAPD comes back to haunt him when a long-imprisoned killer claims Harry framed him and seems to have new evidence to prove it. Bosch left the LAPD on bad terms, so his former colleagues are not keen on protecting his reputation. But if this conviction is overturned, every case Bosch ever worked will be called into question. As usual, he must fend for himself as he tries to clear his name and keep a clever killer in prison. The two cases wind around each other like strands of barbed wire. Along the way, Bosch discovers that there are two kinds of truth: the kind that sets you free and the kind that leaves you buried in darkness. Tense, fast-paced, and fueled by this legendary detective's unrelenting sense of mission, Two Kinds of Truth is proof positive that "Connelly writes cops better than anyone else in the business" (New York Post).